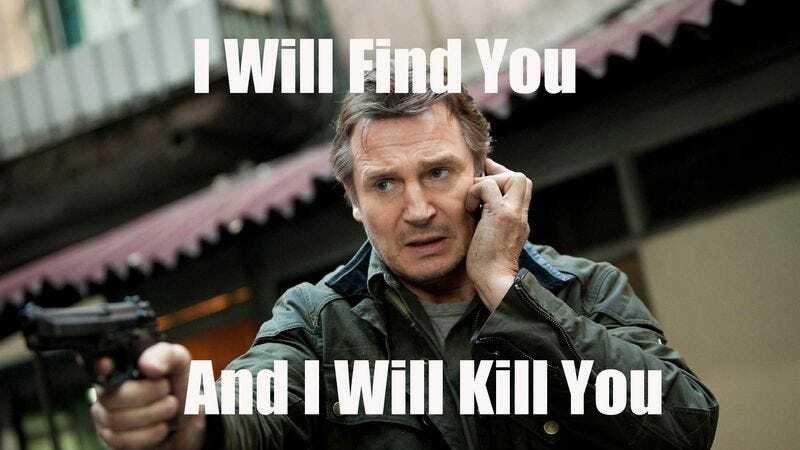 Liam Neeson has had a surprisingly violent career renaissance in the last decade, with the Taken films, especially, launching him into a late-career stint as an action star who leaves a hefty body count in his wake. His latest cinematic murder spree, A Walk Among The Tombstones, opened last weekend, and film distributor eOne celebrated its star’s charming propensity for beating bad guys to death with car doors by putting out a map of all the people Neeson has pretended to kill in his storied career. Despite a few glaring omissions (we know the The A-Team’s shtick is that everybody shoots massive guns at each other and no one gets hit, but surely someone died in that movie, right? ), it’s a pretty good demonstration of Neeson’s methods and favorite murder locales. Headshots are popular, of course, as are lightsabers (if we’re counting battle droids as people, anyway), and Europe is definitely not a good place to hide from Neesonian wrath. It’s also exciting to see that the map’s graphic designer finally got to use that “stabbed with a doorknob” icon they’ve presumably been holding onto for years. The image above is a little on the eye-straining side, so we’ve got a few zoomed-in sections of the map below, and you can see a full screen version of the Kill Map here.